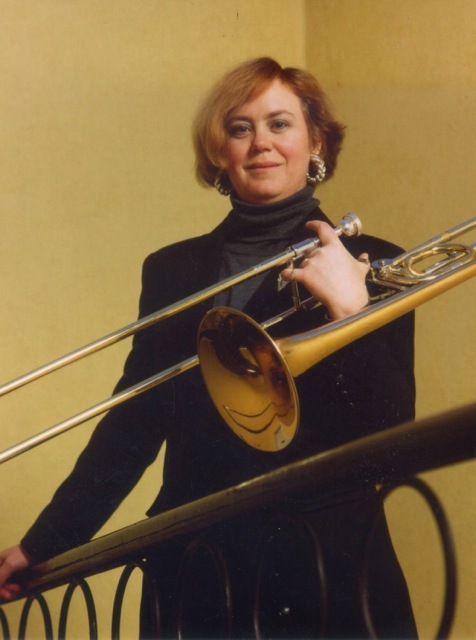 Abbie Conant was first trombone of the Teatro Regio in Turin, Italy from 1979-80 and solo trombone in the Munich Philharmonic 1980 to 1993. The International Trombone Association Journal has featured her in a cover article and described her as “in the first rank of world class trombonists”. She has recorded a highly acclaimed CD of trombone and organ music and has performed as a soloist in over 150 cities in Europe and America. She is Professor of Trombone at the Staatliche Hochschule für Musik in Trossingen, Germany – the first and only woman Prof. of trombone in Germany. She has been a jury member of the Geneva Competition, the Porcia Competition, and the Rimsky-Korsokov Competition in St. Petersburg, Russia. In 1996 was voted President-elect of the International Trombone Association. Her experiences as a woman trombonist comprise the final chapter of Malcom Gladwell’s recent book Blink, which was on the NYT Bestseller list for 18 weeks.